HomeSadducees vs Pharisees. Who Was Right? Sadducees vs Pharisees. Who Was Right? 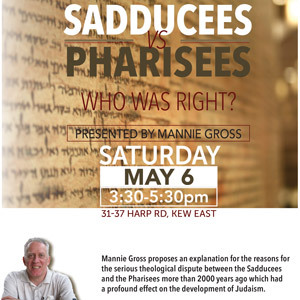 Mannie Gross sheds light on the reasons for the serious theological dispute between the Sadducees & Pharisees which had a profound effect on the development of Judaism. Discussion with follow the talk. Light refreshments provided.